Simplest flying Game in 2016! 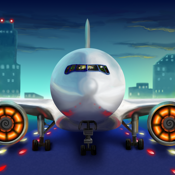 Start as a beginner pilot and accumulate flight hours and money to unlock new routes and planes. Make sure the passengers feel good during take-off, flight and landing by flying smoothly and avoiding technical malfunctions. The goal is not only to deliver passengers from point A to B, but there are plenty of cool missions to complete and win lots of money. -wait for the passengers to board. -swipe the throttle on the right upwards. -ones you gained enough speed push the left arrow to lift up. -swipe the throttle downwards(be carful not to stall!). -stabilize the aircraft using the arrows on the left and touchdown gently on the runway. -push the throttle all the way down to stop. Be the Best Pilot in the World!! !